A big howdy and welcome to you, movie goers! 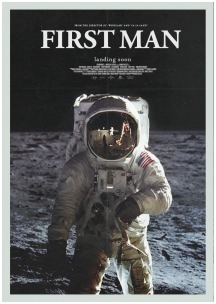 You’ll be delighted to know that our next scheduled movie is First Man, story of a nation undertaking the legendary Apollo 11 spaceflight and first landing on the moon. The film explores the hardships, costs and risks involved in that lunatic mission and unsparingly reports the criticism made at the time against it - say, for instance, the charge of taking money away from poor relief and reform programs, or of putting men to death for the sake of catching up with the Soviets in the run for space military control; but it also makes it clear that no obstacle will ever lessen the human soul’ s inescapable relentless yearning for knowledge or deter them from reaching out for the skies. Do join us this coming Wednesday! Show starts at 7:40 p.m., ticket’s only 4 euros for Capriotti school.